Custom Menu Boards - Martin Sign Co.
Digital Printed menu boards for Squat & Gobble in San Francisco. Custom Menu Boards for Restaurants come in many shapes and sizes. 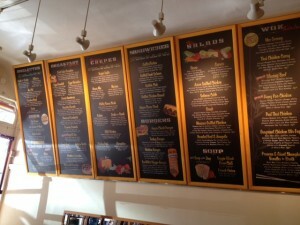 Menu boards for cafes and restaurants are very important to the success of their business. Menu boards need to be clean and easy to read. And since restaurants and cafes have different types of architecture the type of menu boards you choose need to compliment the atmosphere so that your customer has a great experience and they will visit your business again. Menu boards can make a big impression on your customers. If your menu boards have outdated information or if they are dirty and disorganized this will leave a bad taste in your customers mouth. Using masking tape and markers to cover up old prices can look unprofessional. Having products on your menu board that no longer are available can be frustrating to your employees who are taking the orders and annoying the customer who was hoping to eat that item. At Martin Sign Company, we take great care to make sure that your menu boards are the best they can be. MSC offers free site surveys so that we can offer the best menu board solution for your cafe or restaurant. We also love to work with your graphic or interior designer to make their designs come to life. Digitally printed menu boards are a cost-effective solution for your restaurant or cafe. With digital printing, you can print high resolution graphics onto a number of different substrates. Digital printing technology is getting better and better every year. With restaurants needing to change their menu a couple times a year, restaurants need to make these changes quickly and cost effectively. Digitally printed menu boards are good for restaurants that might have artwork full color artwork with photographs. They are also good for restaurants that have many locations. 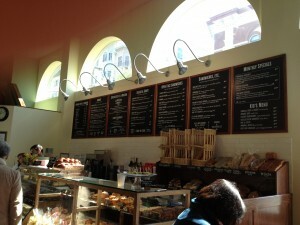 Here are the menu boards for La Boulange in San Francisco at the Polk Street location. Screen printed menu boards is a solution for the simple design. Simple is not bad when it comes to menus. A simple font with high contrast colors will maximize visibility. When a menu is easy to read people will find what they want to order easier and they might order more. Screen printing is good for restaurants that have multiple locations. Screen printing has a more old fashioned, painted look to it. The benefit of magnetic menu boards is that the installation by a sign professional is only needed once. After the framework is installed all that is needed is the magnetic panels to be printed and delivered to the restaurant. Magnetics can also be digitally printed on multiple colors and photographic images. Magnetic menu boards are also a good solution for restaurants that have many locations. Screen printed chalkboard menu boards with custom wood frames for The American Grilled Cheese Kitchen. Chalkboard menus are a good thing for small cafes and restaurants that have a limited menu that changes frequently. Chalk is a good way to erase and start over everyday with new items. Chalkboards are also great for sidewalk signs or a-frames where you want to promote daily specials or happy hours specials. Chalkboard menus are great for food trucks and street vendors where the menu is limited and mobile. Chalkboard menus allow the business owner to be more in control with the day to day operation of the menu without having to call a sign shop every day. Chalkboards can also have screen printed graphics put on them for a very clean classic look. 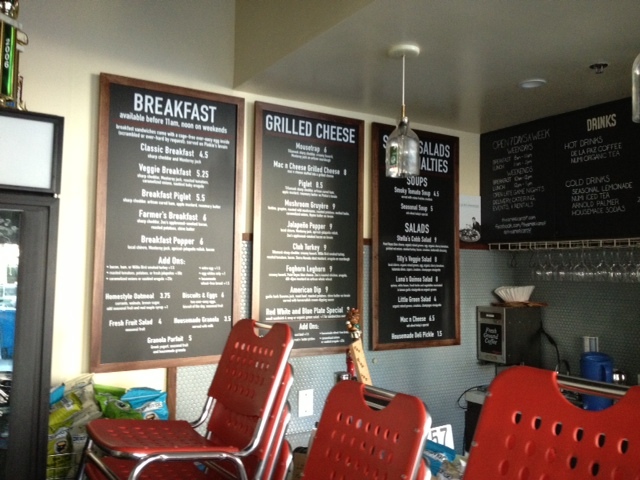 For restaurants with multiple locations screen printed chalkboard menu boards could be a good answer.